I'm wondering how I could/should charge the 18650 batteries used in the following circuit. I want to charge them via USB in a power bank case like this. But I probably won't be able to use the existing charging circuit because I'm using the batteries in series to get more voltage. Use a boost converter to make the higher voltage. This also allows you to control how much current is getting dumped onto the batteries. These kind of batteries need to be carefully monitored while charging and discharging if you want to get full capacity and long lifetime. 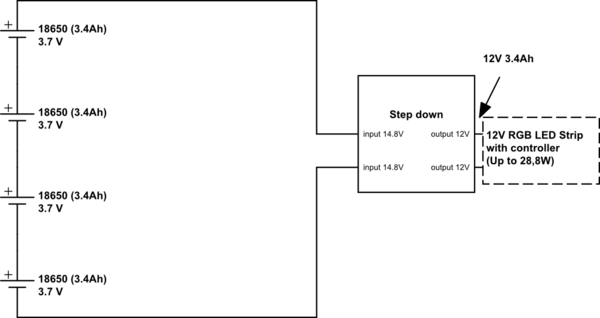 A microcontroller directly controlling the switch of the boost converter is probably the electrically simplest way to achieve that. There should also be a way to measure the voltage of each cell separately, and optional current shunts around each cell. The micro watches the voltage of each cell, and performs cell balancing by enabling the current shunts across any cells above the average voltage, then shut down charging altogether when the cells reach the maximum safe voltage. The micro can control the charging current since it is controlling the switch of the boost converter. It can either measure the current and perform control that adjusts the PWM duty cycle to get the desired current, or it can compute the current open loop by knowing the voltages and the inductance. If you dont have a lithium balancing charger, you are risking the health of anyone in the same building you are in. Never charge lithium batteries in series. Why? Because often one of the batteries in series has more charge left over as the other may been depleted. Why is that a problem? Suppose you have 4 balloons and you let the air out all at the same time; as they empty theres no way to control and keep them equally emptying. One balloon may have thicker walls and squeezes the air out faster than the others. So u stop emptying the air, and u notice one balloon is fuller than the rest. Hence, u cannot see a full or empty battery. Especially in series measuring their combined charge. So you decide to fill (charge) your balloons and ypu wanna top them off best you can. (Here is where ypur problem is. That one balloon will not eaqualize pressure. Its gonna consume charge faster than the empty ones. As you apply the same amperage to all, the battery with the highest voltage (will get above its max charge) lithium doesnt leak like other types it will charge then burst into flames. The explosion of one cellphone battery 1000mah sounds like a 25 caliber gun going off. AND ALL THAT MATERIEL IS ON FIRE ON YOUR FLOOR OR ON ANYONE ELSE IN THE AREA POSSIBLY. Best to charge them in parralel if your gonna do it manually, and baby sit it with a volt and amp meter. You can hook up 12 volts at 4 amps to 4 batteries. long as your amps dont exceed 1.1 volts per battery. In parralel all the batteries equalize each other. When u connect 12 volts to them in parralel, the voltage at the battery wont be 12 volts. Itll be like 2.8 volts long as you dont exceed the amperage of 1.1 x 4 batteries = 4.4 amps and i recommend not exceeding 3.92volts on a 3.7v lithium u are fine. 4.2 volts is maxed charge on 3.7v batts. Not the answer you're looking for? Browse other questions tagged battery-charging parallel series or ask your own question.